Let’s talk about your walls for a few minutes. You may have painted them in a fantastic colour; and perhaps they’re the perfect backdrop for your favourite piece of furniture; and oh, what those walls would say if they could talk! But just maybe, your walls are feeling a bit neglected? I know art can be pricey, especially original art. While I strongly feel that art is a great investment for your home, it could be that you have never found anything you’re crazy about or you just don’t have the money to make that kind of commitment right now. 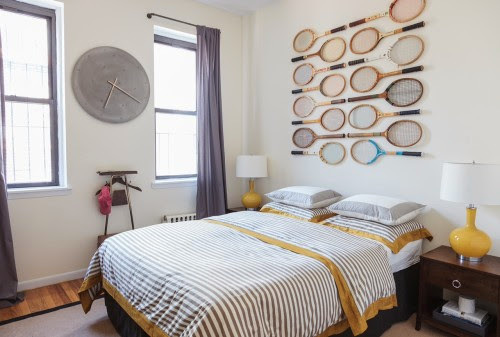 No matter, you can still have incredibly stylish and unique wall art that is personal and heartfelt. You don’t have to cave in and settle for that flimsy framed canvas from the big box store (unless of course that flimsy framed canvas totally speaks to you and is your art soulmate, then by all means – get it!) 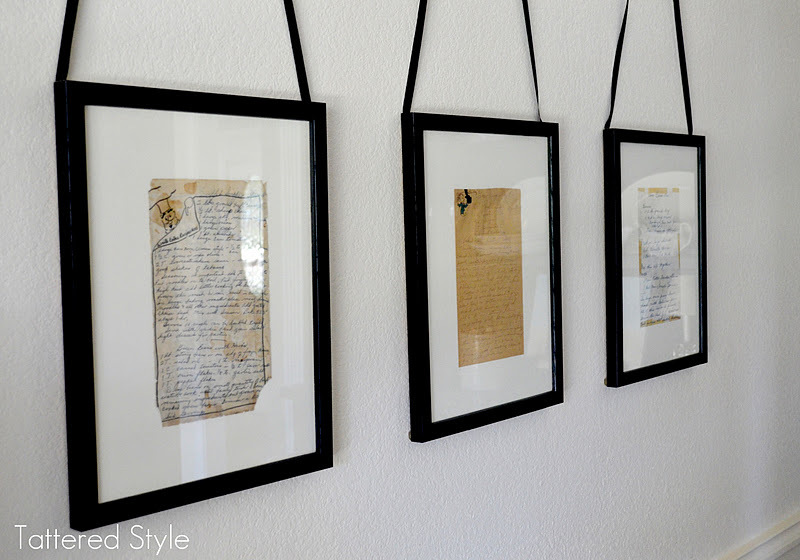 Read on for some creative ways to fill your walls without emptying your bank account. In 2006, Martha Stewart released a home decor/lifestyle magazine called Blueprint. It was like the quirky middle sister of Real Simple and Domino. It only lasted maybe two years but I loved each inspiring issue. 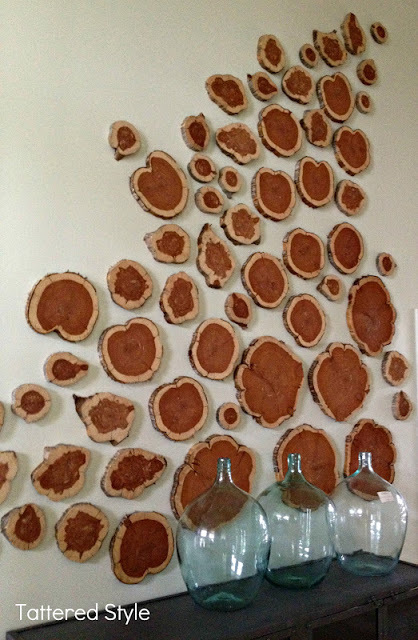 One of my favourite articles featured budget friendly and easy to diy art. 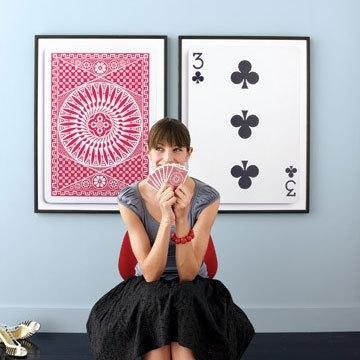 These giant framed playing cards are just enlarged photocopies of a standard card. The best part of this project is that it takes zero skill to pull off. 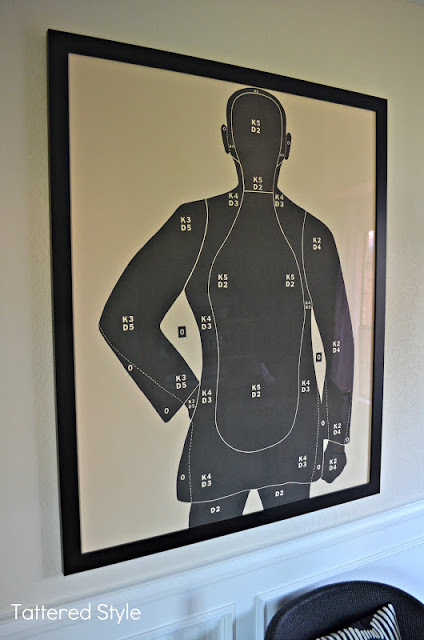 All you have to do is walk into a Staples with a playing card and ask them to enlarge it to your desired size. Then you put it in a frame. I’ll bet the most difficult part of this project will be hanging it on your wall. I can never get my art to hang straight! While you’re at the print centre, how about also enlarging something really personal like a handwritten envelope from a special friend or relative? These next ideas come from one of my favourite design blogs, Tattered Style. 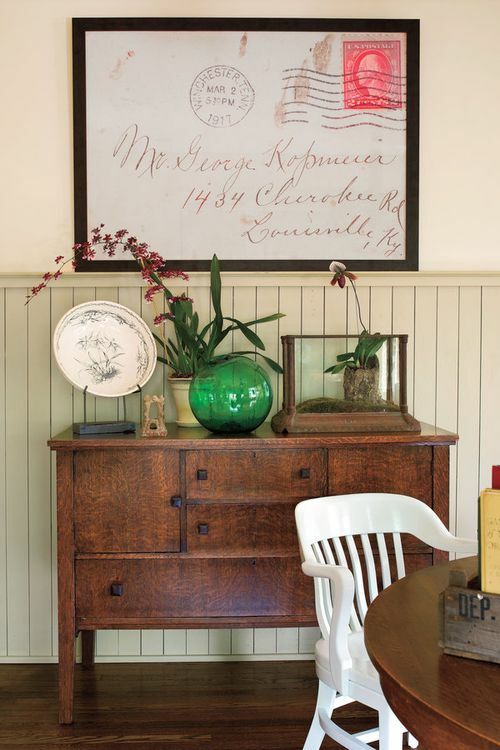 While the blog isn’t updated any longer, it’s a treasure trove of amazing DIY and vintage decor ideas. Slices of a fallen tree. 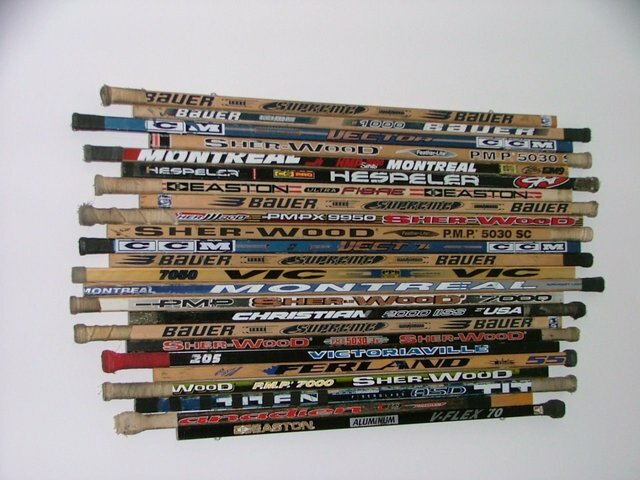 If these ideas have been too sentimental for you, how about some broken hockey sticks? Maybe you’ve been keeping all the old sticks your children used over the years. This is a nice way to bring them out in the open and relive those memories. Sorry – I just made it sentimental again! The thrift stores in my city always have an abundance of these old wooden tennis rackets. This simple but striking display would make a great conversation piece in any sports fan’s home. These blue beauties are from Pottery Barn. As you can image they come with a Pottery Barn price tag. But even those among us who are craftily-challenged could manage to recreate these fairly easily using thrifted handkerchiefs, vintage samplers or other bits of fabric. 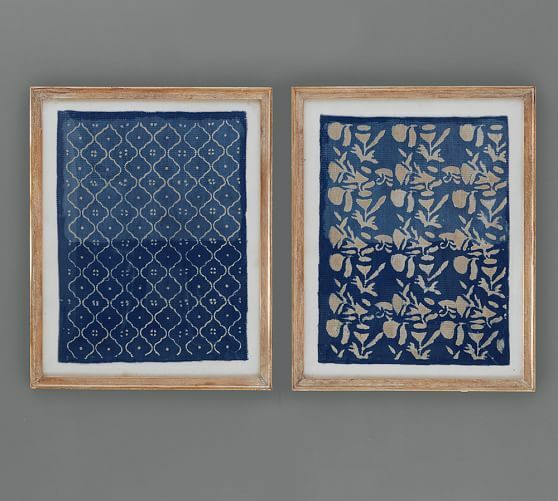 Bonus points if your framed textile is older than you. I snapped a photo of this a few years ago at a store in Toronto. Unfortunately I can’t remember the store or the artist who did this, but isn’t this cool? 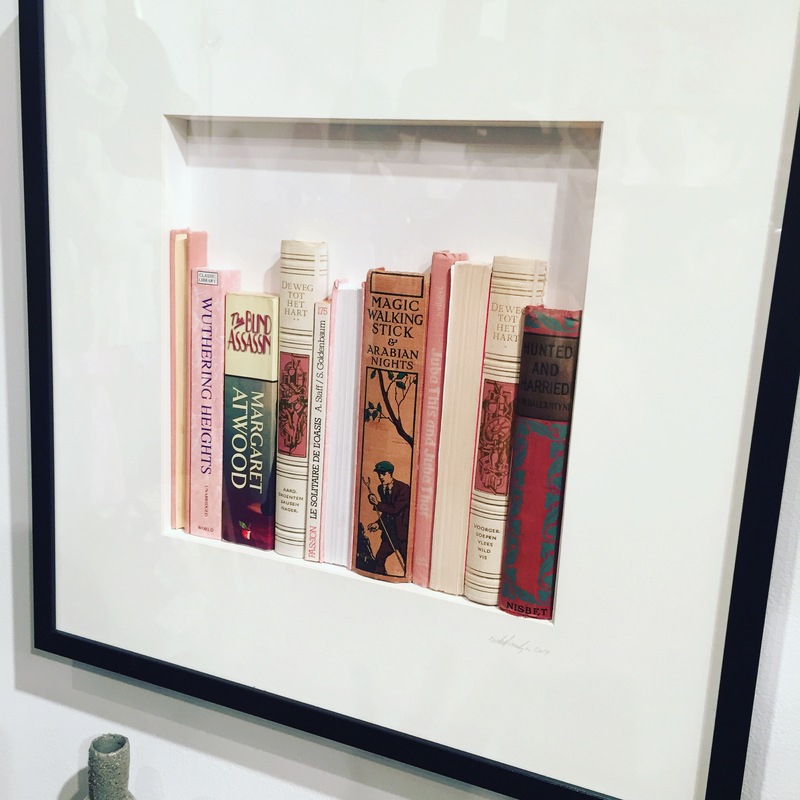 And I’m pretty sure a few of you crafty vixens out there could totally replicate this using old books. I’ve been temped to try it myself but I haven’t worked up the courage to tear apart any of my precious books. Perhaps it will appear one day on this space as a DIY project. Or maybe it will appear on this space as a failed DIY project and cautionary tale. Stay tuned! Whatever you choose to put on your walls it should be a reflect of you. Art should tell your story – whether it’s your accomplishments, memories or just a piece that you’re drawn to. So look around, you likely already have something special and personal that you could display. If not, hopefully one of these examples will inspire you.